Use a large stainless steel pot. Add 1 gallon of purified water. Add 1 cup of organic sugar. Bring to a boil and let it boil with the lid on for 5 minutes. Turn range off. Let it cool down to at least 120 degrees. This temperature will not damage the active enzymes. Add 4-5 black or green tea bags or a combination of both. Stir well. Steep tea bags for 30 minutes. Let the tea mixture cool down to at least 90 degrees. In a large glass container, add 20% sour Kombucha tea as a “starter” and the remainder the new tea mixture. Stir well. Note: Growing in crystal, metal, ceramic or plastic bowls can be toxic! We use only clear, unleaded glass containers. Place the Kombucha culture on top of the tea, rougher, darker side down. No metal can touch the SCOBY. Cover the container with a thin muslin cloth and rubber band. NO cheese cloth. Place in a dim, quiet, ventilated space for 7-10 days. Keep the room temperature between 70-90 degrees. 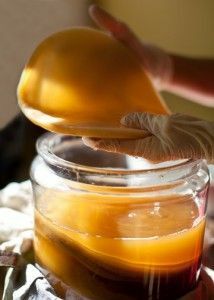 Remove the SCOBY, gently separating the “baby” top layer and the “mom” bottom layer. Start all over right away by doubling the recipe; one bowl for each Kombucha. Pour the Kombucha Tea into a glass jug. 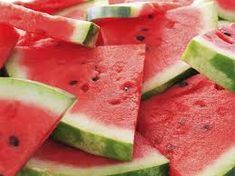 Leave as little air in the container as possible to minimize additional fermentation. Store in the refrigerator to slow down additional fermentation. When it’s time to blend, pour the Kombucha from the jugs back into the glass containers. Use only the best organic ingredients. 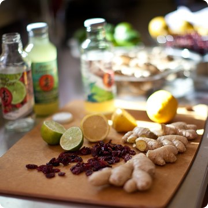 We juice the organic ginger root, squeeze the organic limes and lemons, and use the finest dried organic cranberries and organic blue green algae available. At this stage the flower essences are added. Before bottling, taste to make sure it’s perfect. 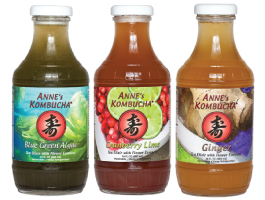 Once it has passed quality control, ANNE’s KOMBUCHA is bottled, capped, and labeled. 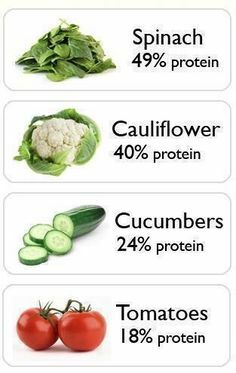 It’s best to drink 4 ounces three times a day, before, after or in between meals. Please contact me for any questions you may have in making your own Kombucha. 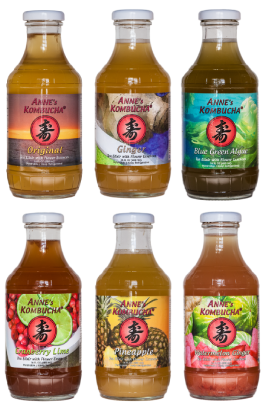 My intention is to build a forum/blog where Kombucha lovers can share their experiences.